Packed with useful information making the book a must for an outlaw-fan or visitor to the county alike, `On the Outlaw Trail` continues Richard`s theme on the world`s most famous outlaw through the medieval era of Nottingham and Sherwood Forest, visiting places and meeting people to define a historical and a practical backdrop to the traditional times against which are set the stories and adventures of Robin Hood. 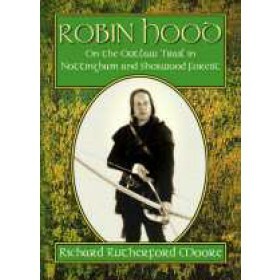 In this publication, Richard gives much of the background research information into `Robin Hood Country` which led to the publication of his first book, The Legend of Robin Hood. After presenting "Robin Hood`s Sherwood Forest" to the delegates of the 2nd International Robin Hood Convention in 1999 for the Nottinghamshire Tourist Unit he appeared in the counties` award-winning promotional video and the new tourist brochure `On the Robin Hood Trail`. Richard acted as historical adviser to The History Channel`s ROBIN HOOD and was consulted for and is at the present time currently contributing to the filming of the first of two new television documentaries the first of which is to be screened in August and named "Robin Hood - Fact or Fiction ?" Richard also featured in the BBC2 `We are History : Robin Hood". Richard is writing the third and last book in his Robin Hood series "On the Outlaw Trail Again - Leaving Sherwood".